Thank you for being so understanding the past few weeks. I know I’ve been MIA. With returning back to the office full-time, training for a marathon and losing my girlfriend Robyn, I’ve been totally consumed emotionally and physically. However, I'm ready to get back into it and looking forward to chatting with you all again. This weekend is a busy one. We have the Great Glebe Garage Sale on Saturday (always super fun!) and I’m running the Ottawa Marathon on Sunday. Yikes! As you know, I love to run, but training for a marathon is a job in itself. So, I’m looking forward on scaling it back a bit after this weekend. Phew! I do have a yummy recipe to share with you today. It's from Canadian Living. I haven’t made it yet, but HELLO…doesn’t it look good? My girlfriend Lisa made it and she said it was oh-so-yummy and really great for a weeknight meal. I’m thinking it also looks great to serve up to friends for a casual barbecue. Thanks for sharing Lisa! Meanwhile, combine oil and remaining lemon juice, garam masala and salt; set aside. Alternately thread tomatoes and onion onto metal skewers. Place chicken on greased grill over medium-high heat; close lid and grill, turning halfway through, until juices run clear when chicken is pierced, about 4 minutes. 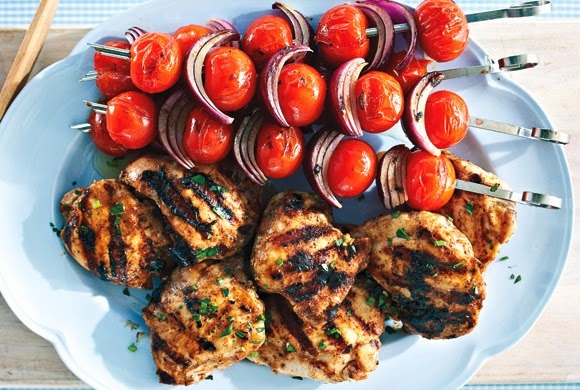 Meanwhile, add skewers; grill, turning 4 times and brushing with oil mixture, until onion is slightly softened and tomatoes are slightly charred, about 4 minutes. Serve with chicken. Definitely let me know if you like it!